Marcus Law is hoping Kettering Town can take full advantage of a run of three home games in a row in the Evo-Stik League South Premier Division Central. The first of those is at Latimer Park tonight (Tuesday) as the table-topping Poppies entertain Redditch United. Kettering go into the clash on the back of four league wins in a row with their latest success - a 1-0 victory at Rushall Olympic at the weekend - helping them to move five points clear at the summit. The Poppies also have home games against St Ives Town and Lowestoft Town to come before they head to Banbury United on December 15 while they also host Barwell in the third round of the CSS League Challenge Cup a week today. But Law is fully focused on the league campaign and he knows his team will have to perform well again tonight if they are to rack up another three points. 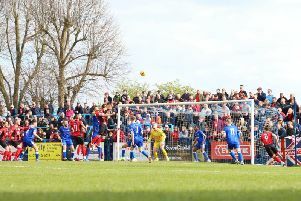 “We have three home league games in a row and we have to try to maximise what we do in those,” the Poppies boss said. “If we can come out of them with the target we have set then we will be very happy with our situation. “Don’t get me wrong, it’s not a given. But we are feeling confident and we believe in what we are doing. “We always seem to have close games with Redditch and I expect it to be very difficult again. “They have had a change in management and they now have a dynamic manager who has a future in the game. The Poppies are set to have Durrell Berry available again after he missed the weekend win while they will also be checking on the fitness of Dion Kelly-Evans after he was ruled out because of injury.